Sun City Center Community Hall overflowed on a grand scale Jan. 30 when Hillsborough County held a workshop to get resident input for an area Mobility Study. Golf carts are important to us. That’s the message to Hillsborough County and the consultants commissioned for a Sun City Center Mobility Study. The mission of Tampa’s Kimley-Horn, a planning and design engineering consultant firm, was to assess existing conditions and needs, especially as they pertain to golf carts. 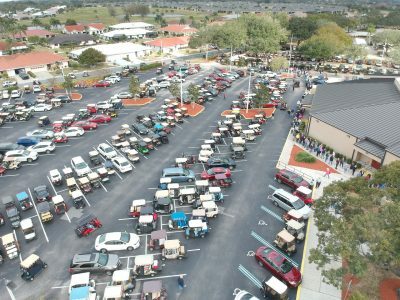 Sun City Center Community Association President Sam Sudman, who serves as the Community Association liaison with Hillsborough County, estimated that there were about 1,400 who turned out for a Jan. 30 meeting, many who drove their golf carts to further make the point. 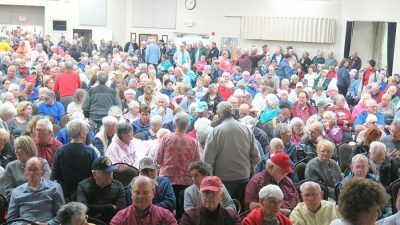 In addition to the hundreds who heard the presentation, a few hundred had to be turned away because of fire safety occupancy limits in the community hall. From left, Hillsborough County Project Manager Mary Sheets, CA President and county liaison Sam Sudman, Kimley-Horn representative Caroline Fraser and Hillsborough County Project Manager Manuel Santos. 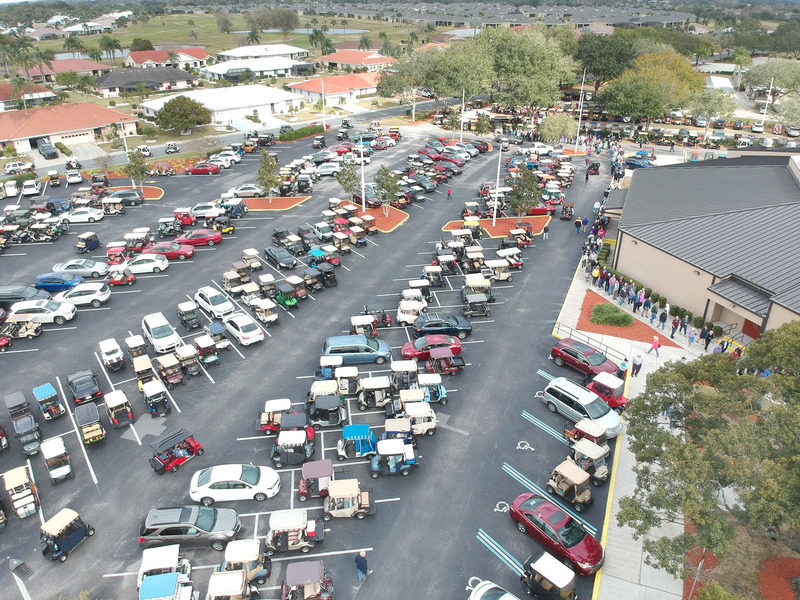 The other Florida communities allowing golf carts, which the firm had studied for comparability purposes, included The Villages in Dunedin, Stuart and Leesburg. Communities in Georgia and California were also studied. They showed several maps displaying existing land use, common SCC destinations, car mobility, golf cart mobility and pedestrian mobility. A study of daily traffic showed car traffic on major roads, e.g., 33,026 on S.R. 674 and 12,147 on 19th Avenue. The top five intersections for accidents over the past three years occurred at I-75 and S.R. 674 (365); U.S. 301 and S.R. 674 (126); S.R. 674 and 33rd Street S.E./Cypress Creek Boulevard (98); S.R. 674 and Kings Boulevard (55); and S.R. 674 and Pebble Beach Boulevard (55). 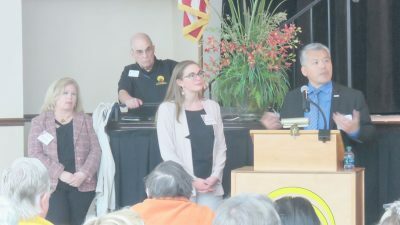 Kimley-Horn then turned to the survey that was conducted between Dec. 14, 2018, and Jan. 8, 2019. About 1,040 SCC residents completed the survey and reported that golf carts were the primary travel mode for 56 percent of residents. For 37 percent, they were the secondary travel mode. Primary trips are for shopping and recreation; secondary trips are for shopping and social purposes. Key survey comments concerned riding at night, path improvements/additions, safety as a priority and operational requirements. Many commented on the fact that, for many, golf carts are the sole means of transportation and the desire for more golf cart designated roads and golf-cart-only paths. Every seat was filled with standing room only as residents clearly demonstrated a passion for golf carts. Consultants Kimley-Horn will hold a second workshop in April and expects to present their report to Hillsborough County in July. Kimley-Horn’s preliminary needs assessment covered opportunities for improvement at specific locations such as Cypress Village Boulevard. There they see opportunities for 8-foot sidewalks, dedicated on-street golf cart lanes, crosswalks, flashing beacons and mid-block crossings. For S.R. 674, they see an opportunity to extend the multi-use path on the north and south sides. The big question — what are the next steps? — was answered this way: Kimley-Horn will draft a Mobility Concepts study in March and will hold another community workshop in April. They plan to present the Final Mobility Concept in May and have a Mobility Plan Report to Hillsborough County in July.